Chief Complaint is an exhibition of new work by Erica Scourti, exploring different kinds of biographical writing and bodily inscription as they relate to the performance and representation of subjectivity. 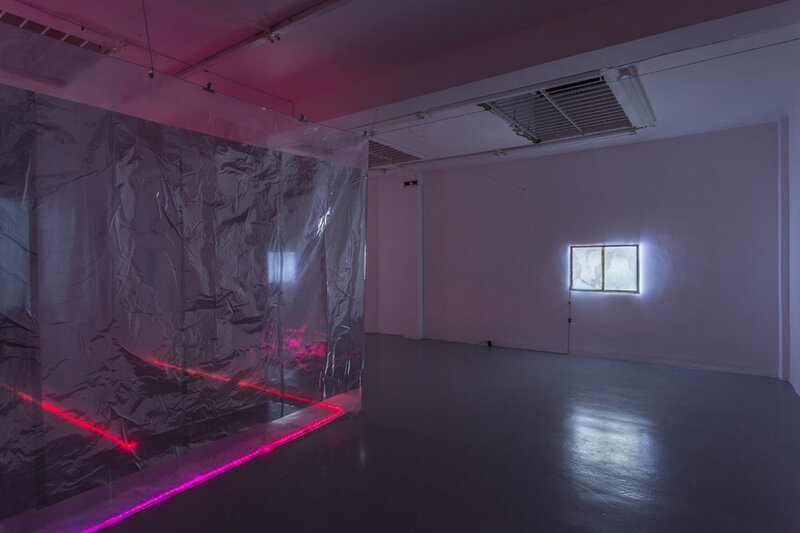 Three components – a mixed media installation, light box drawings, and a publication – overlap in their enquiry into the self as embodied, multiply authored, and environmentally dispersed. 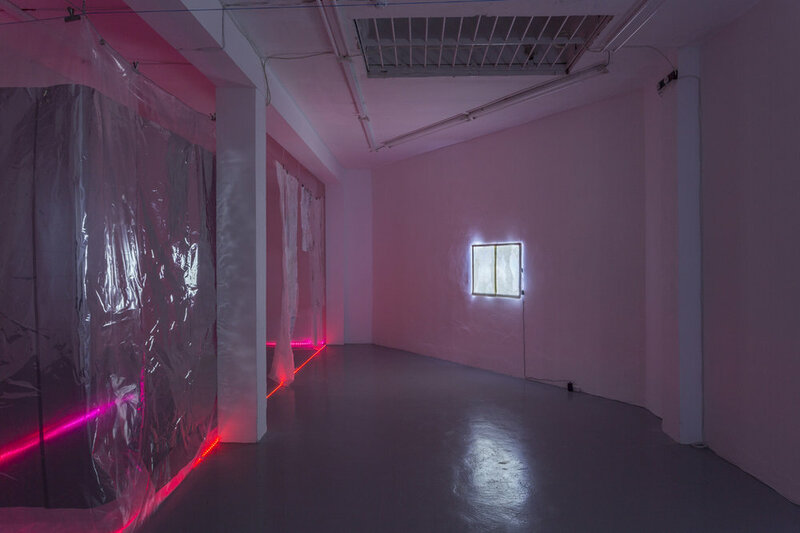 In the centre of the space, accessible via an entranceway between makeshift walls of privacy film, collages, fabrics and colour changing lights, Exit Script is a video projection consisting of automatic transcriptions of voice memos spoken by the artist into her phone during a period begun in January 2017 and continued throughout the exhibition’s production. Stemming from an experimental approach to self-therapy, and a critical awareness of the use of voice recordings in surveillance, the transcriptions that appear in the video are ordered according to arousal as detected by a custom designed algorithm that scours for emotional valence indicated by tone of voice. The lights surrounding the projection respond to six mood categories: neutral, sad, happy, angry, calm and inexplicit. Some moods remain ‘unanalyzable’. Another layer of code listens out for temperament, and the volume of the voice in the video’s soundtrack modulates, increasing in proportion to the ‘intensity’ of mood betrayed. 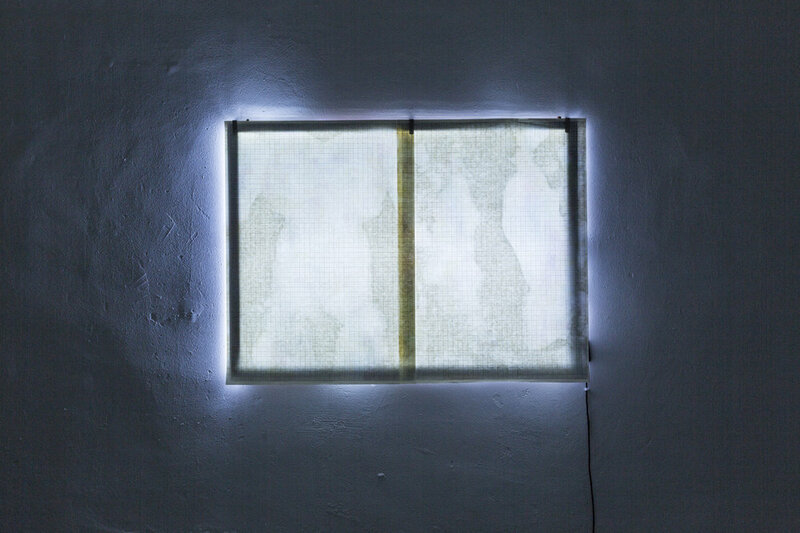 Questioning that there could ever be an objectively measurable analysis of a person by even the most sophisticated technologies, Scourti’s light box drawings Slick I and Slick II are hybrid experiments in the making and interpretation of somatic markers. In this case, sweat and posture have been transferred onto graph paper using salt scrub and oils applied to the body. Where Exit Script privileges the individual artist’s voice, the Slick drawings are ‘mute’. 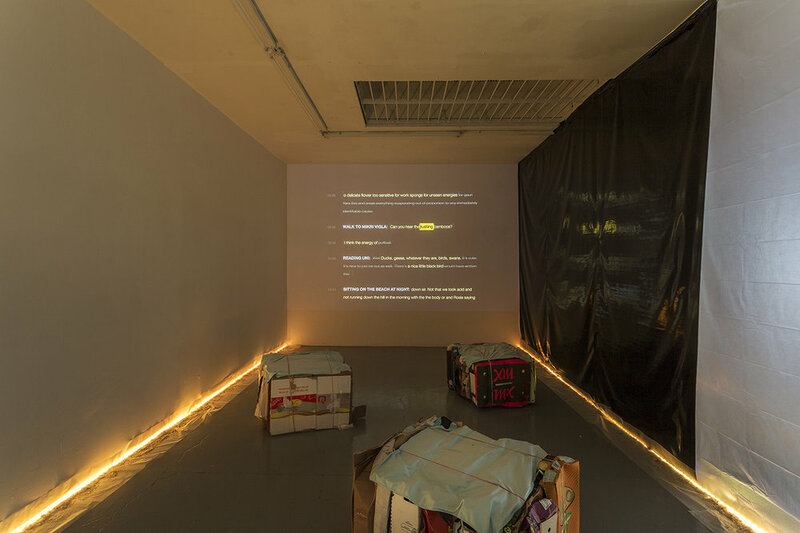 By contrast, Advice from the Fallen puts the voice memo transcripts into conversation with friends and previous collaborators Juliet Jacques, Mira Mattar and Holly Pester, each of whom received a third of the transcript to respond to as they pleased. 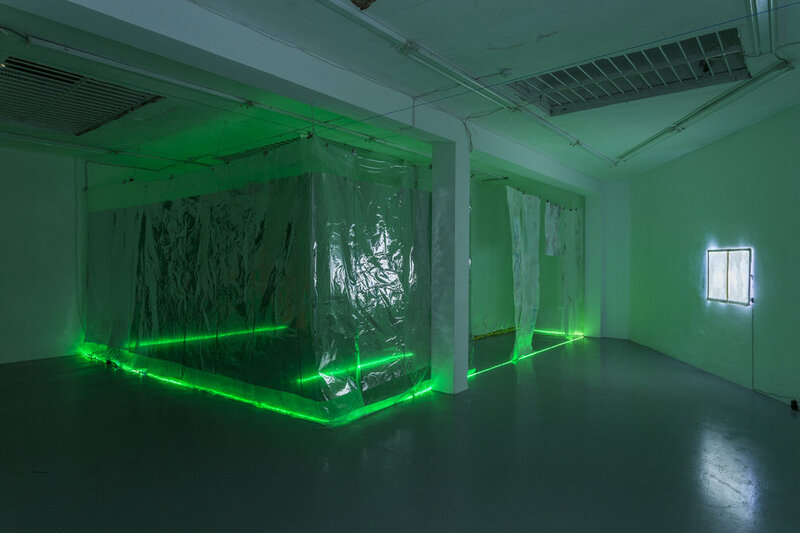 Embracing DIY methods and aesthetics, Chief Complaint puts technological and emotional supports into dialogue with each other, with the exhibition space demarcated as a zone of confinement within which transformation could yet take place. Coding work by Black Shuck, a not-for-profit co-operative that produces and commissions moving image, audio and digital projects.